Normally the Jackson County Courthouse in Scottsboro, Alabama is a peaceful place. The business of property tax payments, drivers license renewals and the weekly Jackson County Commission Meetings. 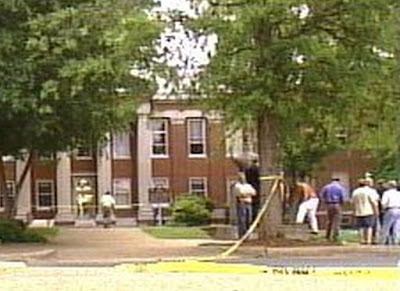 The Jackson County Courthouse erupted in terror on a warm spring day on May 31st 2006 in Scottsboro, Alabama, gunshots broke the calm, blood stained the floors and sidewalks. This is where the Courthouse Security story begins. "If you do not learn from your history, you are doomed to repeat it." Circuit Court Judge John Graham, pictured above (photo by G. Morgan). Circuit Court Judge John Graham related to me at the north entrance of the courthouse after the Security Committee Meeting his vivid account of the incident on that memorable day in May of 2006 at the courthouse entrance, pictured below with crime scene tape. "One of the victims had managed to run back into the courthouse for protection before collapsing. 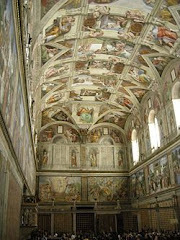 There was blood dripping from his tie, the blood dripped onto the floor, forming a pool. . . I immediately ordered the courthouse doors locked"
Scott Kellenberger, an Alabama Conservation Enforcement Officer, looked out a front windows when the shots rang out. He immediately responded to the front of the courthouse entrance where he met the perpetrator and stopped him at the front door of the courthouse. Source reports stated the perpetrator was headed to the courtroom to finish his attempts to murder everyone involved. Emotional domestic dispute and child custody cases may become violent and present several high risk scenarios. Courthouse shootings and violent incidences are steadily increasing. Judge Graham further stated: "There must be credentialed law enforcement officers at the security checkpoints in the courthouse." No one may be in the courthouse with firearms except law enforcement officers. There have been several attempts to enter the courthouse with firearms. One of the Sheriffs Deputies who regularly mans the security checkpoint related, there have been 6 persons carrying firearms stopped at the security checkpoints since June of this year. One man was arrested acting very suspicious while attempting to enter, he was found to have a cocked handgun in his possession. Additionally, Sheriff Deputies stated they have found numerous large knives. Knives may not be brought into the courthouse longer than 2 1/2 inches in length. 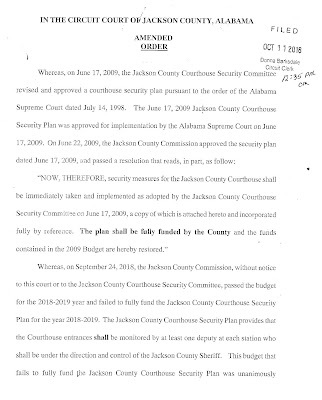 Note on the Judges Order, 1st page, 3rd paragraph: "Where as on September 24, 2018 the Jackson County Commission, without notice to this court or the Jackson County Courthouse Security Committee passed the budget for the 2018-2019 year and failed to fully fund the Jackson County Security Plan . . ." The Order further states the names of the specific commissioners not fully funding the security plan. 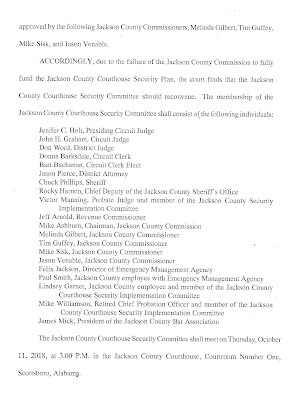 Additionally, the court has ordered the commissioners to reconvene on this issue. During the Security Meeting it was evident that the County Commission's concern was focused on money, not the needs for an effective security deterrent at the courthouse entrances. Further meetings are being planned. 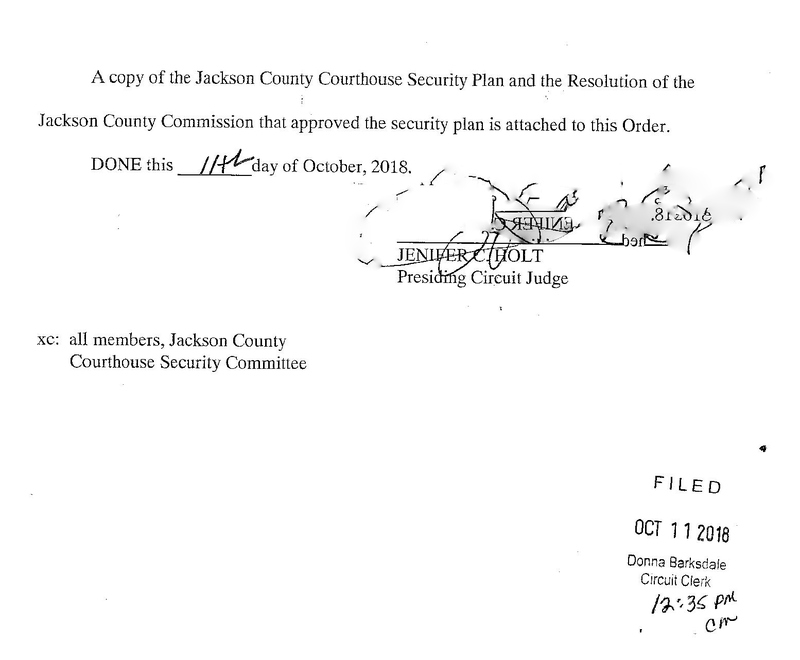 The issue of Courthouse Security will be placed on the agenda at the next Jackson County Commission Work Session on October 15, 2018. There are more questions which need answering regarding discussions and document dissemination between commissioners related to private security hiring instead of the required credentialed law enforcement Sheriff Deputies. Budget meetings, although open to the public, are not work sessions nor regular session deliberations. There have been no open deliberations either in the work session or regular session regarding private security or other contract proposals. However, the commissioners did discuss in depth in the budget meetings various aspects of private contractual services involving the Jackson County Commission. 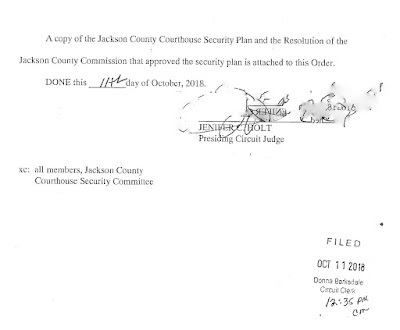 Documents obtained via an Alabama Open Records Request reveals a 11 page two part comprehensive proposal was provided by Dynamic Security of Muscle Shoals, Alabama, per instructions from the Jackson County Commission, on or before September 4, 2018. Discussions within the budget meetings also included problems with the current part time Sheriff Deputies involved in Courthouse Security Services, described as "contracted services" involving security hires part time. The "part time hires" are apparently hired out of the Commission General Fund as Independent Contractors, an IRS Form 1099 is issued at the end of year. All part time "independent contractors," which fill in for Sheriff Deputies off work, are under the supervision of the Sheriff of Jackson County. All of the part time "independent contractors" wear the uniform of the Jackson County Sheriff's Department and are certified law enforcement officials.The problem exists, there are no formal signed contracts and no insurance coverage which would cover the employee if there was an on the job injury, after all, they are "independent contractors." An interview with the Jackson County Personnel Manager has revealed items of concern regarding this issue. The commissioners have not discussed this matter in any open meeting and some commissioners have attempted to be "secretive" about these facts, knowing full well there is a problem regarding the hire of independent contractors as part time Sheriff's Deputies. 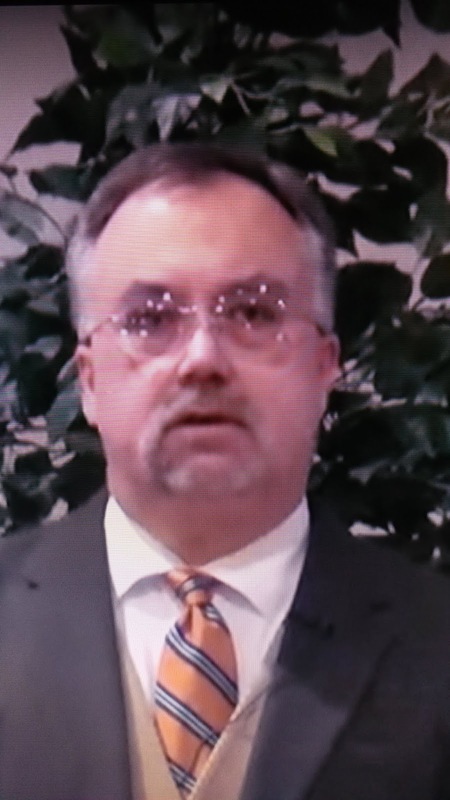 The Jackson County Commission instructed their administrator, Robert Manning, to obtain recommendations regarding private Courthouse Security Services and at least one proposal from a private security service. 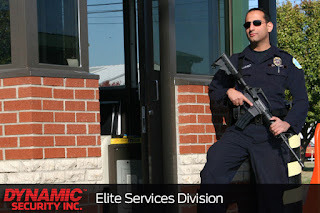 Below, a picture of Dynamic's Elite Security. Photo from Dynamic Security's 11 page proposal for the Jackson County Courthouse. 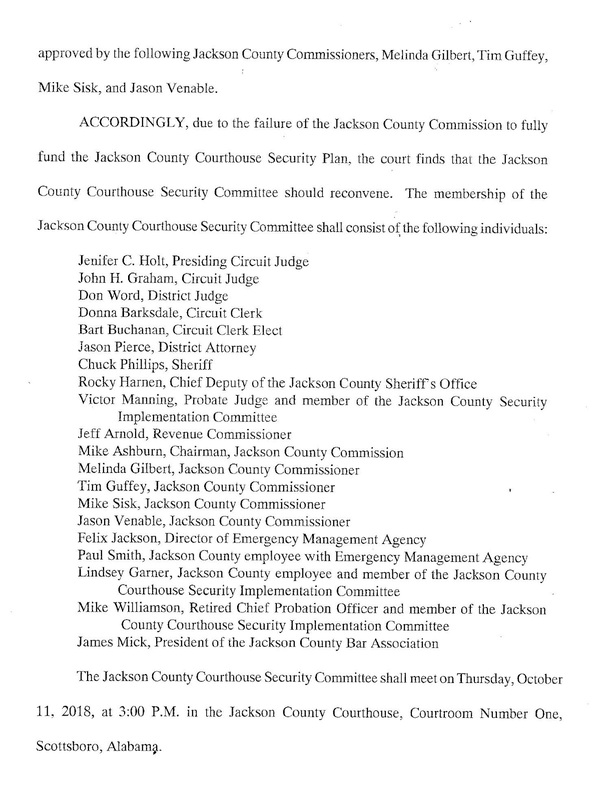 (Dynamic Security photo, Fair Use for non-profit news reporting and commentary) Will the Jackson County Commission utilize any of the other private contracted services of Dynamic Security, particularly those involving various aspects of personnel management, clerical operations and other services. Recommendations were received from three separate county government entities in Alabama and Florida: Escambia County Florida; Marshall County Alabama and the Economic Development Authority of Dallas County Alabama. 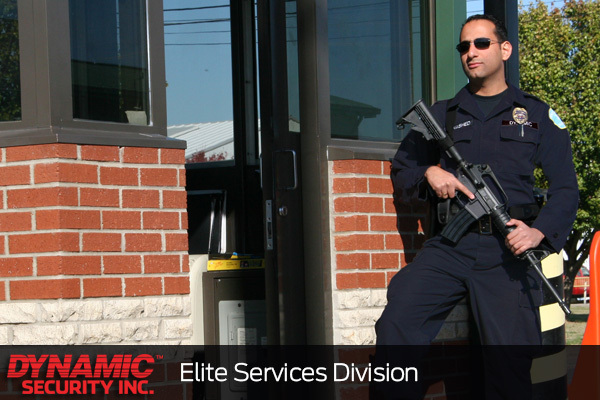 Part 1 proposal: Dynamic Security, Inc. proposes the identified hourly rate of $14.99 for an UNARMED Security Officers to perform professional security duties as outlined in future communications. Specifically post instruction and security duties as outlined by the management team and Jackson County. Facility Staffing - Part-time, Temporary workers, Full-time, Industrial workers, Clerical workers, Professional placements, Additional human resource services." 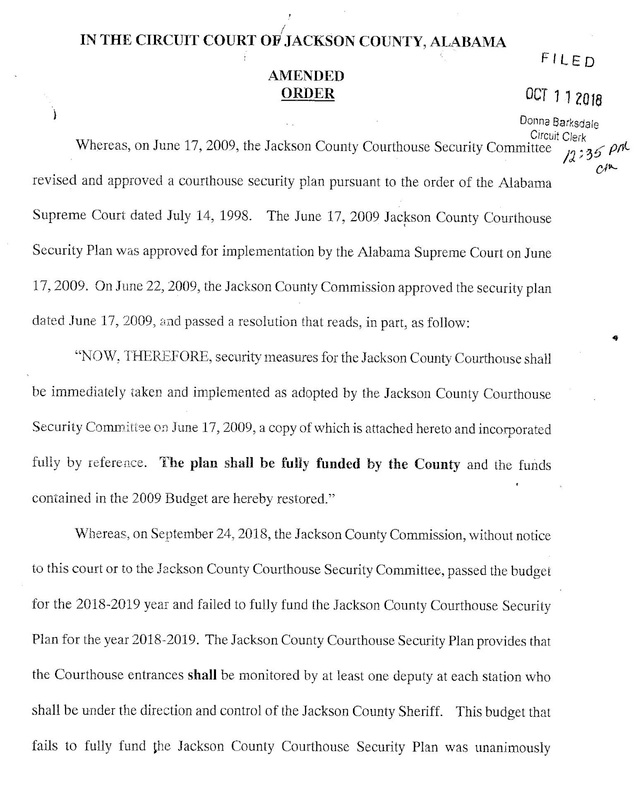 Article excerpt: "The County Commission did not fully fund the Courthouse Security plan in their budget because they had been looking into hiring a private security firm to monitor the Courthouse . . .All commissioners at the meeting said their intentions were to save money anywhere they could, not just courthouse security." Additional Problems relating to the Courthouse Security issues involve communications failures between all leadership involved in Courthouse Security, a problem solving group meeting should occur to resolve the issues and bring forward proposed resolutions to the full Courthouse Security Committee. 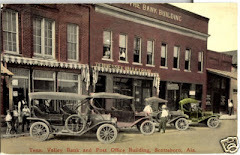 Previous articles on this issue from "In the Boro."